Histoplasmosis: Histoplasmosis is a lung disease caused by a fungus (Histoplasma capsulatum) found primarily in soil and areas contaminated with bird or bat droppings. The disease is transmitted to humans by airborne fungus spores from areas contaminated by pigeons and starlings, as well as other birds, and also bats. If a building has a pigeon infestation, the droppings can accumulate in significant amounts and serve as a fertile breeding ground for the fungal growth. The area under a pigeon roost usually has to have been enriched by droppings for two years or more for the disease organism to reach significant levels. At-risk areas include enclosed spaces, such as accumulations of droppings in buildings or in attics. Infection occurs when the fungal spores, carried by the air are inhaled by people — especially after a roost has been disturbed. Most histo infections are mild and result in a minor influenza- like illness. However, on occasion, the disease can cause high fever, blood abnormalities, pneumonia and even death. National Institutes of Health (NIH) has reported a potentially blinding eye condition — presumed ocular histoplasmosis syndrome (OHS) — that probably results from the histo fungus. NIH estimates that 4 percent of those exposed to the disease are at risk of developing OHS. Cryptococcosis: Pigeon droppings appear to be the most common source of the disease fungus Cryptococcus neoformans in the environment. The fungus is typically found in accumulations of droppings around roosting and nesting sites, for example, attics, cupolas, ledges and water towers. It has been found in as many as 84 percent of samples taken from old roosts. Even when old and dry, bird droppings can be a significant source of infection. Like histoplasmosis, most cryptococcosis infections are mild and may be without symptoms. Persons with weakened immune systems, however, are more susceptible to infection. The disease is acquired by inhaling the yeast-like cells of the organism. Two forms of cryptococcosis occur in humans. The generalized form begins with a lung infection and spreads to other areas of the body, particularly the central nervous system, and is usually fatal unless treated. The cutaneous (skin) form is characterized by acne-like skin eruptions or ulcers with nodules just under the skin. The cutaneous form is very rare, however, without generalized (systemic) disease. Outbreaks (multiple cases at a location) of cryptococcosis have not been documented. Psittacosis and toxoplasmosis: Also associated with pigeon roosts and the accompanying droppings, these diseases are normally not severe in people; however, serious illness or death does occur rarely. Pigeons and sparrows also have been implicated (along with many other species of birds) as sources of encephalitis viruses carried by mosquitoes. Avoid inhaling air that may be contaminated with fungal spores, and don't disturb or contact piles of pigeon waste. 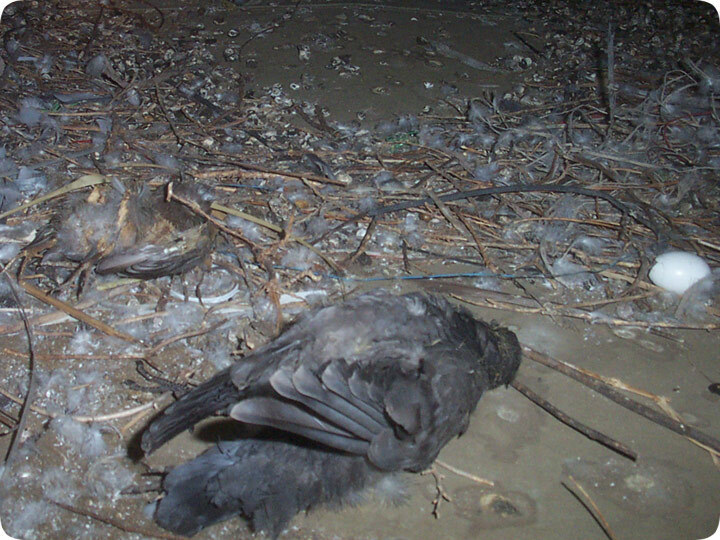 Avoid contact with food or water that may have been contaminated with pigeon waste. Avoid direct contact with any pigeon excrement or nesting material. Have any contaminated areas professionally cleaned. Prevention - Eliminate any pigeon roosts or infestations in buildings, and have those buildings sealed shut to keep birds out, or have deterrents such as pigeon spikes installed to keep pigeons from roosting.